Had it not been for the Vietnam War, the C-123 would have been just another of those airplane designs that came along, served a few years, then faded off into obscurity. By the time the Provider entered service with Tactical Air Command in 1955, the airplane was already obsolete. Although the airplane had excellent short-field landing characteristics, it was slow, underpowered and could carry only 16,000 pounds The airplane was an outgrowth of a World War II glider design known as the CG-20 that originated with Chase Aircraft, but came too late for World War II service. In the early 1950s Fairchild tried to sell the airplane to the Air Force as a jet transport with four tiny jet engines, two mounted under each wing and developed a prototype XC-123A. But the cost of the airplane was way too much for the capabilities it offered so Fairchild instead went with the C-123B, which was powered (underpowered, actually) by a pair of Pratt and Whitney radial engines. The concept behind the C-123 was that it would function as a powered glider, an airplane that could land a load of troops or cargo on an assault strip and remain on the ground until a runway long enough for it to takeoff again could be constructed. But by the time the C-123 entered service, TAC had already ordered four-engine C-!30s and the C-123, like TAC's UH-21 helicopters, was destined for a short life as a transport. As the faster and more capable C-130 entered service, TAC's C-123s were transferred to the reserves, or to special airlift tasks such as the support of remote arctic sites in conjunction with the construction of the DEW line. By 1961 only one Air Force unit was still flying the C-123, the 464th Troop Carrier Wing (Assault) at Pope AFB, North Carolina. Even the 464th was scheduled to transition into C-130s. But events on the other side of the world gave the C-123 a new lease on life. During the summer of 1961 a panel of counterinsurgency experts met in Saigon to determine how best to assist the South Vietnamese goverment in their effort to defeat the Viet Cong insurregency. A lack of adequate airlift was placed at the top of a list of South Vietnamese deficiencies compiled by the panel headed by British expert Robert Thompson. Though the United States Army wanted to assist the Vietnamese with helicopters and it's own CV-2 "Caribou" transport, Air Force Chief of Staff Curtis Lemay insisted that the C-123 was the ideal candidate for operations in Vietnam. In early December, 1961, the Pope wing was alerted to dispatch a squadron to Clark Field, Philippines for a TDY of 120 days. Operation MULE TRAIN departed Pope two days later, and arrived at Clark by late December. After two weeks of orientation at Clark, the C-123s relocated to Tan Son Nhut. MULE TRAIN was proceeded by a USAF advisory mission known as FARM GATE, which included a handful of C-47s for airlift, among other duties. But FARM GATE had come to Vietnam with an advisory role. 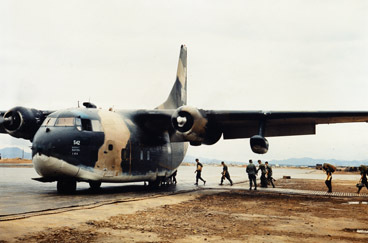 The MULE TRAIN C-123s were there as conventional airlifters whose task was to assist the South Vietnamese government forces by providing airlift. Another C-123 mission, Project Ranch Hand , which involved low-altitude spray missions, arrived in South Vietnam at about the same time. Once the MULE TRAIN C-123s began operations in Vietnam, they set the tone for airlift operations for the next four years, and to some extent for the rest of the war. The C-123s soon established an airlift route structure within the country that used a dozen existing hard-surfaced airports as bases. Every C-123 mission in Vietnam originated from or landed at one of those 12 bases. Combat airlift was the C-123s forte, and TAC encouraged PACAF to exploit the airplane's capabilities in this regard. The Air Force wanted to set up quick reaction teams at Tan Son Nhut made up of a battalion of South Vietnamese paratroopers and C-123s, VNAF C-47s and USA helicopters to airlift them to respond to emergencies throughout the country. The Army was cool to the idea, but General LeMay sold President Kennedy and the Vietnamese premier on the idea. But while the concept was sound, the kind of war then being fought in Vietnam did not lend itself to such practices. By the time the paratroopers arrived in the vicinity of a battle, the enemy would have melted into the forests and rice paddies that constituted the terrain of South Vietnam. A more practical use of the C-123s involved airlifting South Vietnamese combat units around the country for military operation, thus making the Provider a "force multiplier" as it provided increased mobility to the South Vietnamese government forces. At the same time, the Provider became invaluable within the transportation infrastructure. After the MULE TRAIN force proved the value of the C-123 in the kind of operations required in Vietnam, a second Pope squadron was deployed to the region. While MULE TRAIN operated out of Tan Son Nhut, SAWBUCK went to Da Nang to preform airlift tasks in the northern third of the country. A C-123 detachment operated for a time out of Bangkok, until the arrival of a company of Army Caribous at Korat. A primary C-123 mission throughout the first years of the Vietnam War was the support of US Army Special Forces. A detachment of C-123s and C-47s was set up at Nha Trang for the exclusive use of Special Forces. While the larger C-123s were usually used to land at airstrips by the camps, the C-47s airdropped their cargo to the more remote camps. When necessary, the C-123s dropped as well. In late 1963 the TAC rotational squadrons were gradually replaced by permanently assigned C-123 crews who had been drawn from the Air Force at large and put through a training course at Pope. One Pope squadron transferred as a unit, to become the 311th Air Commando Squadron art Da Nang. The PCS C-123s were assigned to the 315th Troop Carrier Group, but the squadrons bore the designation of the air commandos, a new USAF special air warfare organization that was under development at Hurlburt Field, Florida. But while the air commando units at Hurlburt were given special training, the C-123 crews of the 309th, 310th and 311th Air Commando squadrons remained conventional airlifters, just as had been their predecessors from Pope. The three squadrons were joined in late 1964 by the 19th ACS, which flew out of Tan Son Nhut. A fifth C-123 unit was part of the 606th ACS at Nakonphanom AB, Thailand, a unit that flew an assortment of airplanes, including C-123s whose primary mission was dropping flares for strike missions in Laos. Flare missions were a responsibility of C-123 squadrons in South Vietnam as they gradually relieved the C-47s of that chore. The same crews who flew airlift missions by day flew flare missions at night, as nightly missions saw the Providers in the air from the Mekong Delta to the DMZ. With the arrival of US combat troops in Vietnam in 1965 the C-123 mission changed somewhat. Along with US troops came USAF C-130s, and the C-123s were integrated into a common airlift system that assigned missions based on payload capabilities and runway lengths. While the C-130 needed 2,500 feet, the smaller C-123 could get by with 1,800. while the Army's CV-2, which was also operating in Vietnam would transfer to the Air Force in 1966, could get on and off of runways as short as 1,200 feet. The C-123s were used to haul men and equipment into shorter airstrips that were inaccessible to the C-130s, usually because of length. Airdrop remained a major C-123 responsibility throughout the war. There were many remote camps throughout Vietnam and they were usually supplied either by helicopter or fixedwing airlift, a task the Provider was well suited for. C-123s were involved in several difficult missions during the Vietnam War, particularly during airdrop missions in support of camps such as Plei Mei and A Shau. To airdrop supplies to the defenders of the camp at A Shau, the C-123 crews had to spiral down through a hole in the overcast that had been discovered by A-1E pilot Captain Bernie Fisher, who won the Medal of Honor for landing his airplane on the airstrip to rescue another pilot. Two special operations mission used C-123s. Project DUCK HOOK involved the use of Vietnamese and Chinese crews to deliver supplies to Vietnamese teams opertating inside North Vietnam and Laos. Project BLACK SPOT was a modified C-123 equipped with a bomblet dispenser for use against trucks on the Ho Chi Minh Trail in Laos. C-123s were operated by AIR AMERICA, the CIA airline. Beginning in 1966, the C-123 force in Vietnam was upgraded as the C-123Bs were replaced by C-123Ks, which were the same airplane with the addition of jet engines under each wing. Though the addition of the jet engines did not improve the airplane's payload or speed, they greatly increased its short-field takeoff performance and provided a safety margin that had been lacking in the original airplane. During the siege of Khe Sanh, the C-123s continued to land after the Air Force put a halt to C-130 landings. Though most of the supplies delivered to the Marines were by C-130 airdrop, the C-123s brought in items too fragile for airdrip and evacuated casualties and personnel when they were able to land. Five C-123s were lost at Khe Sanh. The most famous C-123 flight of the war was L/Col Joe M. Jackson's mission into the camp at Kham Duc to pick up three airman after the camp had been previously evacuated by C-130s and Army and Marine helicopters. Earlier in the day Major Ray Shelton had landed and brought out a load of evacuees as the camp was being evacuated under fire. Prior to Jackson's flight, two C-130s had been shot down at the camp. After the camp was evacuated, another C-130 was mistakenly ordered to land and discharge the three airmen, who ran off into the camp. When it was learned that three Americans were still on the ground at Kham Duc C-123 pilot L/Col Alfred Jeanotte attempted to pick them up. But his crew did not spot the three men until after he had taken off again. Jackson was taking a check ride from Maj Jesse Campbell, who was one of the most experienced C-123 pilots in Vietnam. They landed and picked up the three airmen. Miraculously, their airplane did not take a single hit! Jackson was awarded the Medal of Honor, Campbell the Air Force Cross, and the two enlisted crewmembers, TSgt Edward Trejo and SSgt Manson Grubbs each received the Silver Star for the historic flight. By 1971 the Vietnam War had reached a low ebb and US troop withdrawals had begun. A program to transfer the C-123s to the Vietnamese was begun. By the spring of 1972 all C-123s in Vietnam were being flown by South Vietnamese crews. The VNAF C-123s failed in an effort to resupply the besiged town of An Loc after North Vietnamese forces surrounded the city. They were relieved by USAF C-130 crews who took heavy casualties before a method of high altitude drops was developed. After the US withdrew from Vietnam, the VNAF equipped with C-130s, and a few C-123s went to Air Force Reserve units. In the early 1980s the last airplanes were flown to the aircraft graveyard. Some wound up in civilian hands and are often seen in television ads. A few C-123s were used in support of the Nicaraguan Contras, including the one that was shot down leaving the loadmaster, Air America veteran Eugene Hausenfaus, as the only survivor. C-123s were featured in the movie AIR AMERICA.